Payload specialists, Greg Jarvis, Bill Butterworth, John Konrad and Steve Cunningham have been extremely busy over the past three months preparing for their March and August shuttle flights next year. In addition to carrying out their normal responsibilities as Hughes employees, they have participated in preliminary training and customer and public relations activities. They have also spent many hours preparing the carry-on experiments which will be performed by Greg Jarvis during the March mission. A trip to Houston in September presented a new set of challenges for the Hughes as well as the British and French payload specialists. The greatest test was the high altitude chamber which determines how individuals react to a lack of oxygen during training in high performance aircraft. All of the payload specialists spent an hour in the high altitude chamber breathing pure oxygen to rid their bodies of nitrogen: This reduces the chances of suffering the bends. The pressure was then reduced to that experienced at 22,000 feet elevation. The participants were asked to remove the oxygen masks. What followed was a light case of hypoxia (or oxygen depletion), which caused temporary tunnel vision and color blindness. Their finger tips also turned blue and began to tingle. Finally, their brains “checked out” momentarily, as if they were blacking out. 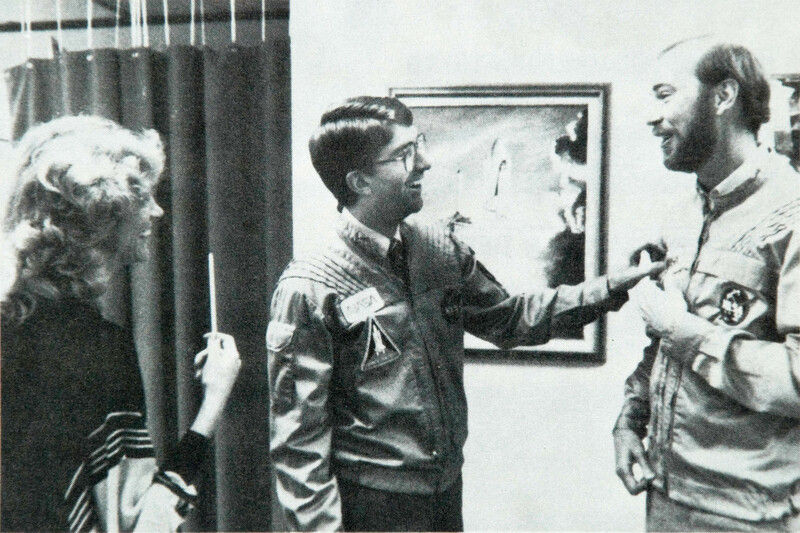 The test conductor only received vacant smiles from the French, British and Hughes payload specialists. He quickly helped them put on their masks. During the trip they were also fitted with their space flight coveralls and pressurized g-suits which they will wear during the 3-g shuttle landing. HC Payload Specialists Steve Cunningham (left) and John Konrad (right) get fitted for their training coveralls during recent trip to Houston. The payload specialists were then flown to Cape Canaveral where they walked from the top of the launch pad to the bottom, exploring and learning about every inch of the shuttle. Back at home, the payload specialists have spoken to various professional organizations and groups about the space program and about Hughes’ role in launching satellites. The groups have included a local second grade class, who wrote thank you letters to Greg Jarvis for his visit and asked him if they could go into space with him. One of the primary roles of the payload specialist is to perform carry-on experiments developed by Hughes to improve future spacecraft design. Bill Butterworth has been working all the details of the fuel-slosh carry-on experiments which will be conducted during the March flight. The experiments are currently in the process of being approved by NASA, after which construction will begin. These experiments have been designed to yield information about fluid mechanics in a zero-g environment. Understanding more about the real properties of liquid in a confined vessel in space will lead to a higher liquid to solid fuel ration for satellites of the future. And the benefits of this transition for Hughes and for NASA are enormous because liquid fuel is more efficient than solid. 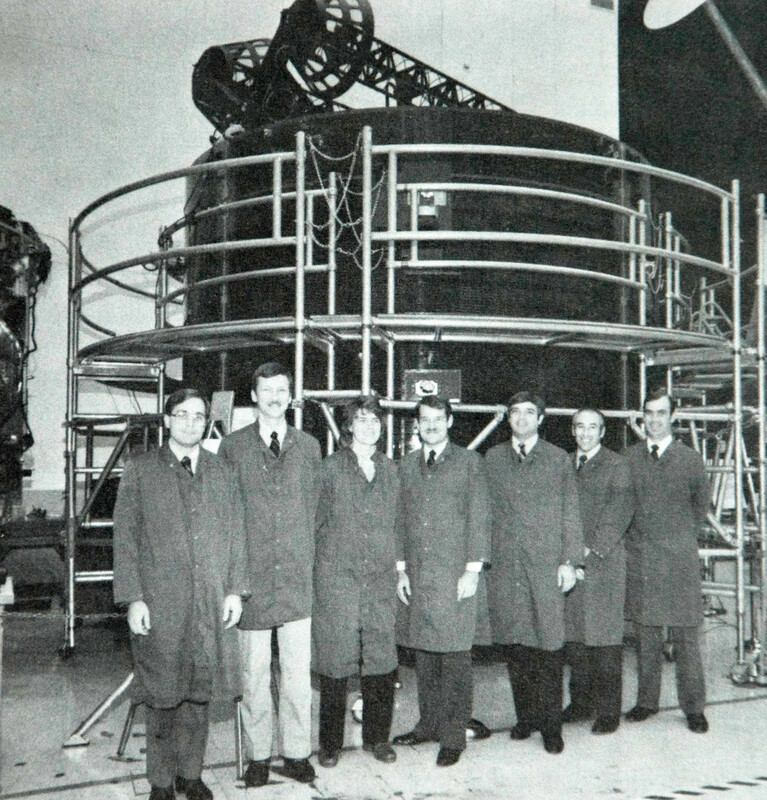 The payload specialists also hosted a recent visit to Hughes by the entire shuttle crew of the March 1985 flight. While here, they attended briefings on Leasat, a tour of the High Bay, and a tour of our OCC given by Dennis Padrick. By the end of the visit, Greg and Bill felt very much part of the crew, which will be an important factor during the coming months of training. Shuttle crew for Mission 51D stops in front of Leasat 3 on recent High Bay tour. Pictured from left to right: Bill Butterworth (backup HC specialist), Steve Nagel, Shannon Lucid, John Creighton, Dan Brandenstein, Greg Jarvis primary (HC specialist), and John Fabian. In the next Signal issue, we’ll cover the actual training period and their final preparations for the March launch. Note: These descriptions of the activities of the Hughes payload specialists were first published in Signal, the HCI newsletter. These two issues were kindly lent to me by Rex Ridenoure. There are subsequent issues with coverage relating to these activities. If anyone has these available I would appreciate being able to borrow them so that I can continue this coverage.